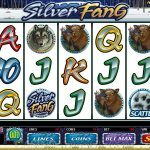 Silver Fang is a game from Microgaming that takes us to the Far East in the Japanese wilderness to help a hunting wolf. The slot is fairly basic looking and there are not many symbols that are connected with the theme. In the background we have a snowy landscape on a serene night, the perfect time for hunting. There are only 2 special symbols in Silver Fang, the wild and the scatter. The howling wolf is the wild symbol and during the base game it functions as a normal wild. It helps you in creating a winning combination by replacing all the other symbols except for the scatter. But, during the free spins the wild becomes stacked and this is when you can land some pretty good wins. The wilds stay on top of one another and you get more opportunities to create winning combinations. 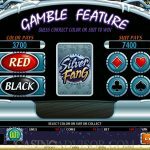 The main feature in this game is the free spins round. All you need to do is to land at least 3 scatter symbols to activate 15 free spins. All the wins during the round are multiplied by x 5. 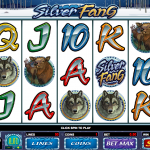 Microgaming has done an outstanding job when they created Silver Fang. The game may look very basic and straightforward but that is what punters are looking for. It has all the elements of a successful slot, wilds, multipliers and most of all free spins. This is one of the most anticipated features when it comes to online slots. Some, actually many players prefer free spins to bonus games. On the other hand this is a high variance slot so you might not see a win for a while but when you do, the amount can be life changing. That is reason enough to play this game. If you also would like to have a secret admirer then consider playing Secret Admirer a 5 reel slot by MicroGaming.